Could the current Sharpe ratio for the S&P 500 be a signal of things to come? The Sharpe Ratio is a short-hand method to evaluate the relationship between the return and risk (volatility) of an asset. When William F. Sharpe first published his research in 1966 he called his ratio the “reward-to-variability” ratio. Today the measure is widely used to show risk-adjusted return. The calculation for the Sharpe ratio is the return of an asset in excess of cash divided by the volatility of that asset over that same period. Generally speaking, the higher the Sharpe ratio the better. 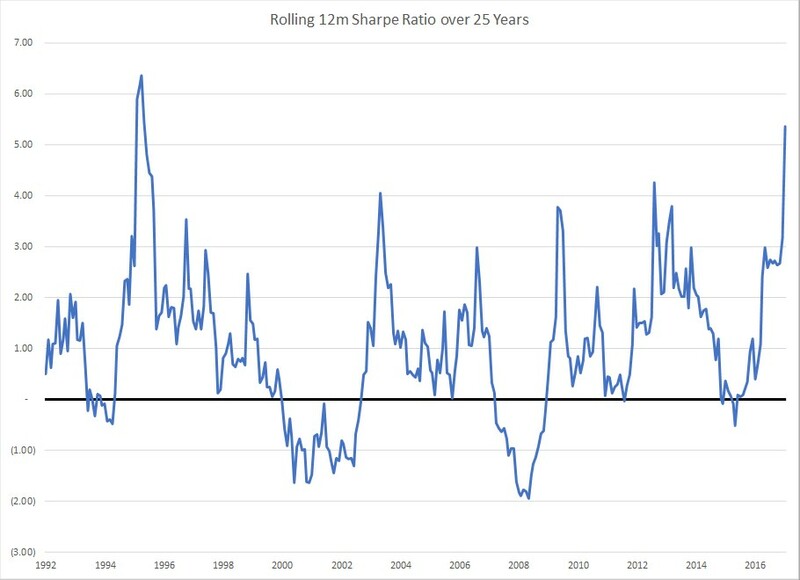 Over the past 25 years, the average annual Sharpe ratio for the S&P 500 has been 1.0 with frequent periods of much higher and lower levels. Over the past 12 months, the S&P 500 is up 23.6% with a standard deviation of 4.2%. Cash is currently yielding 1.25%. This results in a Sharpe ratio of 5.4 [(23.6% – 1.25%) / 4.2%] which is in the 98th percentile over the past 25 years. This means that only 2% of the time has the Sharpe Ratio been higher than it is today. Anything is possible going forward but our counsel to investors would be to expect lower Sharpe ratios due to lower returns, higher volatility, or both.